Click here to read the final recommendations from the "Financing Arizona's Future" Town Hall. To read the Final Report of the 109th Town Hall, click here. 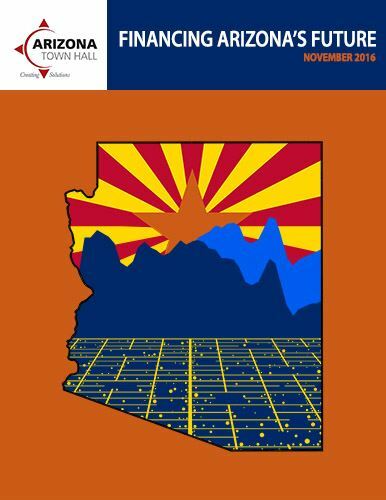 Tax Cuts have cost Arizona $4B without the promised growth, gains: Economists, Mike Sunnucks, Phoenix Business Journal, October 19, 2016. Financial Review with Sinclair Noe, Sinclair Noe, Money Radio Network, October 25, 2016. Financial Review with Sinclair Noe, Sinclair Noe, Money Radio Network, November 11, 2016. Arizona Town Hall focuses on state's financial structure, Cassidy Rust, Mesa Independent, November 18, 2016. Arizona Town Hall Focuses On How To Finance State's Future, Steve Goldstein, KJZZ 91.5 FM, November 23, 2016. Our View: Plan needed to maximize state's potential, Marie Sullivan & Jim Zaharis, Phoenix Business Journal, December 2, 2016. Viewpoints: How low taxes and bad investments hurt Arizona's future, Kevin Olson and Sheila Breen, The Arizona Republic, December 11, 2016. Education Roundtable: Businesses back K-12 funding, but don’t always walk the walk on providing it, Mike Sunnucks, Phoenix Business Journal, December 16, 2016. 109th Town Hall considers long-term strategies for sustaining state's finances, Linda Elliott-Nelson and Tara Jackson, Arizona Capitol Times, December 21, 2016. Financial Review with Sinclair Noe, Sinclair Noe, Money Radio Network, December 30, 2016. Town Hall urges overhaul of state finances, Peter Aleshire, Payson Roundup, December 30, 2016. Arizona Town Hall builds unity, voice and purpose, Talonya Adams, The Arizona Republic, January 1, 2017.
Financing Arizona's future: A discussion on the eve of the 2017 legislative session, Mike O'Neil, The Think Tank, KTAR News 92.3 FM, January 6, 2017. Ted Maxwell: How Arizona Town Hall can help save our state through conversation, Ted Maxwell, Arizona Daily Star, January 9, 2017. Arizona Week - January 13, 2017, Arizona Week, Arizona Public Media, January 13, 2017. Arizona Horizon, Arizona PBS, January 19, 2017. Guest Column: Modernizing finance system to maximize Arizona's potential, Paul Brierley, John Courtis and Linda Elliott-Nelson, Yuma Sun, January 26, 2017. Arizona Town Hall: Lack of spending in key areas is hurting state's ability to attract quality workers, Jenna Miller, Phoenix Business Journal, February 1, 2017. WMBORT presents 2016 Arizona Town Hall Results, Barbara Bruce, White Mountain Independent, February 10, 2017. Local town hall tackles state financing issue, Eric Petermann, Sierra Vista Herald, March 18, 2017.
Financing Arizona's Future Is Topic at Community Program, Sedona.biz, March 28, 2017. How best to finance Arizona’s future, Max Efrein, The Daily Courier, April 7, 2017. Major Changes Recommended to Improve Financial Future for Arizona, Ray Newton, Quad Cities Business News, May 8, 2017. Community Statements generated at the Community Outreach Programs on "Financing Arizona's Future." Click here to view the presentation made by Kil Huh.